Very little is known of this English painter. He was estranged from his wealthy family who disapproved of his artistic career; on his death, they destroyed his papers, and there are no known surviving photographs of him. 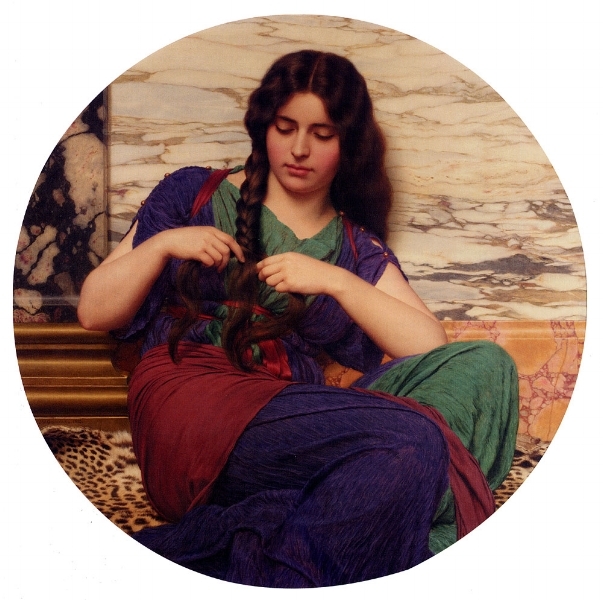 John William Godward was born on 9th August 1861 to John and Sarah Godward, the eldest of five children. His father was an investment clerk at the Law Life Assurance Society in London, and the family eventually lived in Wimbledon. Being the firstborn and the oldest son, it was assumed that Godward would follow his father into the world of insurance. Even though Godward was already showing more interest in his creative side, he found himself training to be an insurance clerk. Realising that his son would, most likely, not continue in the insurance profession, and to take advantage of his artistic side, Godward’s father arranged for him to train as an architect – a much more lucrative, respectable career than a simple artist. Between 1879 and 1881, Godward studied under William Wontner, a family friend who was also an architect and designer. But all was not lost, for Godward worked alongside Wontner’s son, William Clarke Wontner, himself a painter who would go on to become a popular painter of landscapes and murals. As for Godward’s own artistic training, it’s not known where he trained and with whom. There are no records of him at the Royal Academy Schools. However, it could be that Godward was helped in some way by William Clarke Wonter who, in 1885, was teaching at the St John’s Wood Art School, whose students typically went on to the RA Schools. His first work dates from around 1880, and in 1887, Godward had one of his paintings, ‘The Yellow Turban’, accepted at the Royal Academy Summer Exhibition. One can only imagine how thrilled he must have been. But that probably wasn’t enough to satisfy his parents’ hopes that their oldest son would make something of himself. He must have been under tremendous parental pressure, which took a mental toll. Now in his mid-20s, with a painting accepted by the RA, Godward had to decide which path to pursue, and that path was art. He chose to paint in the Victorian Neoclassical style; a style inspired by the art and architecture of Classical Greece and Rome. 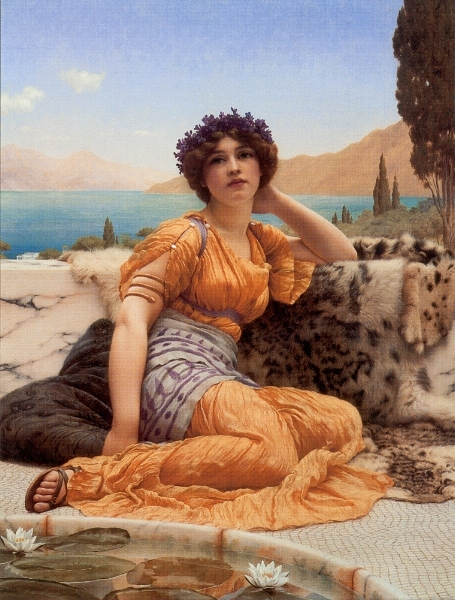 Godward greatly admired the leading Classicists of the time; Sir Lawrence Alma-Tadema’s influence can be seen in Godward’s use of marble and textiles, and that of Sir Frederic Leighton can be seen in the glossy finish of his paintings. Like Alma-Tadema, who was not only a painter but also an archaeologist who visited historical sites, Godward, too, meticulously studied details such as architecture and dress to give his work authenticity. He also painstakingly studied any feature he used in his paintings, from wild flowers to animal skins. Godward’s father died in 1904. 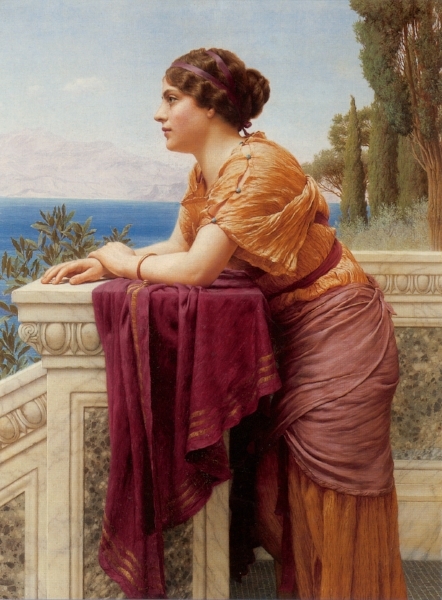 The following year, Godward made his first visit to Italy, which he found captivating. Unlike many of his contemporaries, Godward had always preferred privacy and anonymity. In 1912, he left for Italy with one of his models (the one in ‘Dolce Far Niente’). Outraged, his family severed all contact with him. By 1921, with his health failing, suffering from depression and no longer enchanted with Italy, he returned to England. But the country he returned to was no longer interested in the Classical style. In fact, it proved to be nothing short of hostile toward his style of art. As the world’s artistic preference started to embrace modern art, Godward would become one of the last, best European Classical painters. Although not as prolific as he had been, Godward continued painting. What was possibly his last completed work, titled, ‘Contemplation’, was sold to a firm of art dealers. He died soon after. Godward chose to end his life on 13th December 1922. According to the newspaper report of his death, the cheque for that last painting had been left pinned to his door. Although saddened by his death, his family also felt disgraced; no Godward had committed suicide before, and to have it so publicly reported, with the accompanying inquest, left them more angry than sad. His mother, Sarah, literally cut his image from family photographs, and his personal papers were destroyed. If he was mentioned at all, it was only in whispers. The only one who spoke openly about him was his only sister, Mary Frederica, known as ‘Nin’; she called him, “my brother, the artist”. But the one thing even she never spoke about was the manner of his death. For many years after his death, Godward’s paintings held little value. They couldn’t be found at art dealers; between the 1940s and 1960s, many of them had passed their Godwards to Harrod’s to sell. By the end of the 1970s, Godward the painter and his art had faded into obscurity. Happily, interest in Godward’s art has since seen a resurgence. One of his paintings, ‘A Fair Reflection’, which would have been worth about £5,000 in 1979, sold for £900,000 in New York in 2012. The paintings I've included here barely scratch the surface of his output; the man was a prodigious painter; between 1880 and 1922, he painted more than 133 works! I won’t be posting next week as the call of the sorting/tidying is now so deafening, I can’t ignore it any longer. Hopefully, I’ll be back on Tuesday, 12th September.